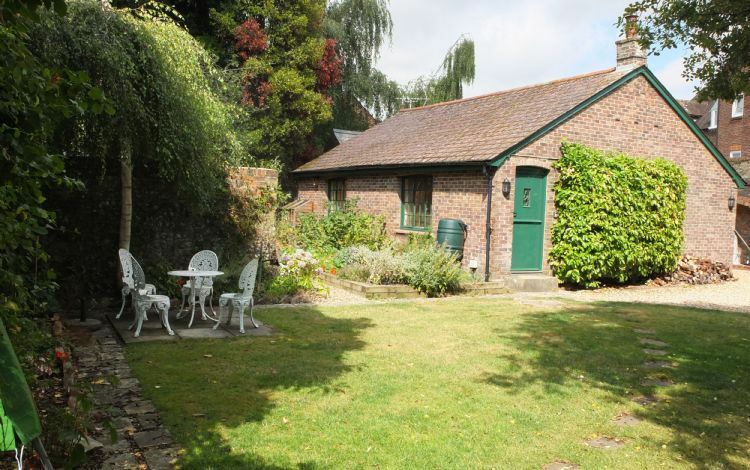 Brewery Cottage is a very well appointed and characterful single story cottage set in the rear garden of a historic town house, close to Chichester city centre. Having been converted from what was once the billiard room of an old pub, the cottage retains some of its original character while also offering the conveniences of modern living and very comfortable, high quality accommodation. The access is via the rear courtyard to the main house, through secure gates. There is a parking space available to guests in this courtyard, as well as an outside seating area in the gardens. The parking space is secure with electronic gates. Please note the garden is shared with the property owner. The cottage itself offers a large, open-plan sitting and dining area, with the kitchen set back in one corner. You can relax on the very comfy sofas and on those colder nights, keep warm in front of the wood burning stove. The kitchen area is well equipped and includes a combination microwave and oven, ceramic hob and dishwasher. The double bedroom leads off from the main living area and through to the en-suite shower room with modern and stylish fittings. Brewery Cottage is just a short walk from one of the four main shopping streets in Chichester city centre. It is also within walking distance of the famous Festival Theatre and Cathedral, as well as both local and larger shops, making it an ideal location from which to be based. Chichester is an historic city with strong Roman connections and has an enormous array of things to do and places to visit. The city is blessed with a variety of beautiful architecture, with great care having been taken to preserve its character. The ancient walls surround the city centre and one can walk along them, through various scenic parks. There is a thriving tennis and squash club, along with various fitness and health clubs and there is a selection of shops and restaurants, the latter offering excellent choices for the most varied culinary tastes. Just to the north of Chichester are the stunning South Downs, with lovely rolling countryside and as well as many picturesque Downland villages. There is the Goodwood horse racing track to visit, along with the world famous motor sports events held annually, such as the Festival of Speed and Goodwood Revival. Golf is also available at Goodwood and the polo at Cowdray Park, near Midhurst, is just a short drive away. There is excellent sailing in Chichester Harbour, as well as windsurfing at the Witterings and diving at Bracklesham Bay. London is less than 2 hours away, either by road or rail. Brewery Cottage is in a great location, situated right in Chichester town centre, within walking distance of many places to eat, pubs and shops. Ideal for two people, very comfortable and I really enjoyed my stay there. Nice quiet location and very friendly owners nearby. My husband and I stayed for 7 nights and the only thing I would have liked to see change would be a washing machine included and some form of heating in the bathroom as it was very cold in there in January. There is a heated towel rack but it wasn't working. Also as there isn't a washing machine maybe some clean towels after a few days would have helped. In all fairness I didn't ask about clean towels and this very well may have been something that could have been arranged had I asked. Otherwise very nicely appointed, clean and comfortable. Very comfortable and well located. Brewery Cottage is very well presented and equipped, with the single exception of laundry facilities. Our visit and stay were for business purposes and the cottage provided a welcome break from hotel living. mooie cottage, centraal gelegen. Alleen jammer dat de eigenaar ook gebruik maakt vd tuin, waardoor we niet de privacy hadden waar we wel om hadden gevraagd van tevoren. Ventilatoren of een airco zouden ook welkom zijn geweest. Verder hadden we de pech dat de naaste buren bezig waren met een tuinrenovatie, waardoor er veel herrie was met machines e.d. En de andere naaste buren waren bezig met hun huis ah verbouwen, er werd gebruik gemaakt van slijpmachines, motorzagen etc, de hele dag veel herrie, hier zit je niet op te wachten als je vakantie hebt, het laatste project was al maanden bezig was en het was fijn geweest als de eigenaar dit van tevoren had gemeld. Brewery Cottage is just a short walk from one of the four main shopping streets in Chichester city centre. It is also within walking distance of the famous Festival Theatre and Cathedral, as well as both local and larger shops, making it an ideal location from which to be based. Chichester is an historic city with strong Roman connections and has an enormous array of things to do and places to visit. The city is blessed with a variety of beautiful architecture, with great care having been taken to preserve its character. The ancient walls surround the city centre and one can walk along them, through various scenic parks. There is a thriving tennis and squash club, along with various fitness and health clubs and there is a selection of shops and restaurants, the latter offering excellent choices for the most varied culinary tastes.Just to the north of Chichester are the stunning South Downs, with lovely rolling countryside and as well as many picturesque Downland villages. There is the Goodwood horse racing track to visit, along with the world famous motor sports events held annually, such as the Festival of Speed and Goodwood Revival. Golf is also available at Goodwood and the polo at Cowdray Park, near Midhurst, is just a short drive away. There is excellent sailing in Chichester Harbour, as well as windsurfing at the Witterings and diving at Bracklesham Bay. London is less than 2 hours away, either by road or rail.